I made my first cake pop one year ago. 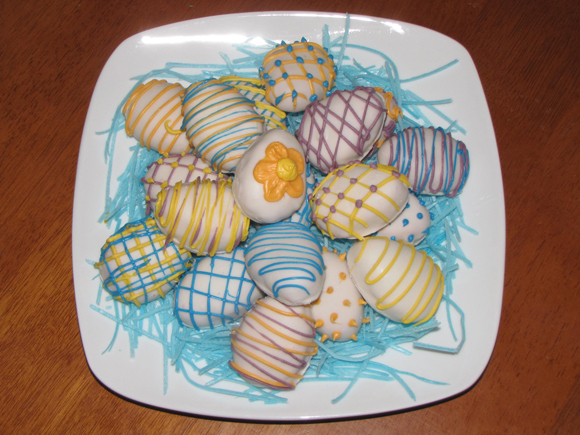 I started strong with some Easter cake pops done two ways: chicks and Easter eggs. The chicks were really cute and the eggs were pretty cool, but I wanted something a little different this time. I normally make pops (cake balls on lollipop sticks) but this time I went with just the cake ball. I actually did some at Christmas time (they haven't made it to a post yet) but they were just standard ball shapes. These latest Easter-themed cake and frosting concoctions were egg shaped and decorated as such. I did the egg shape last year, but since they were on a stick, they were a lot bigger. I think this year's are a much better size. I even went an extra mile and made them cherry flavored. The secret to that? Cherry Jello. That's it! I did add a bonus maraschino cherry in the middle for a little extra boost, but all in all, they're not too different than the regular cake pops that everyone has grown to love! For complete, illustrated steps for making cake pops, click here to see my 4th of July Pops. Simply mix cake box ingredients according to directions, adding the jello mix directly to the batter before baking. Mix all the frosting ingredients together and mash with cooled and crumbled, baked cake. Roll into 1" balls, pushing a maraschino cherry in the middle and re-forming the cake around the cherry. Form balls into an egg shape and freeze for about 15-20 minutes. Dip in melted candy coating and allow to dry for a few minutes. Decorate as desired with additional candy coating.